There are two locations in Tableau Server or Tableau Services Manager (TSM) where administrators can view the state of Tableau processes. You may be able to access one or both of these locations, depending on how your account and server are set up. Most of the process status information that displays is duplicated on both Status pages. This article explains each page, and identifies what is unique for each one. 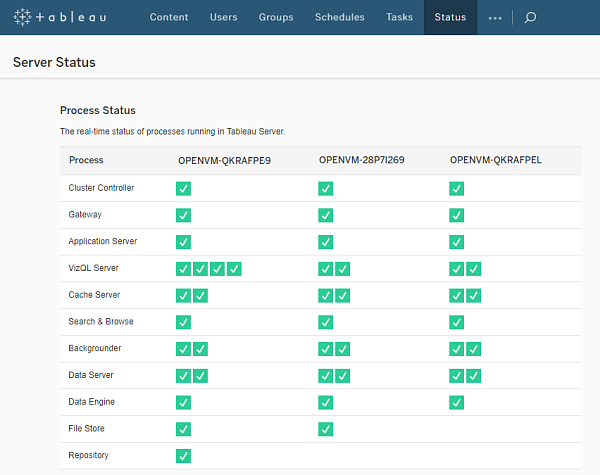 The Tableau Services Manager (TSM) status page is accessible in TSM and can be viewed by TSM administrators. You must be able to log into TSM to see this page. For information about signing into TSM, see Sign in to Tableau Services Manager Web UI. The Tableau Server status page appears in the Tableau Server web UI and is accessible by Tableau Server administrators. This page includes Tableau Server processes, along with links to troubleshooting documentation if a process is not running as expected. If you hover your mouse pointer over the status indicator for a process, a tooltip shows the node name and the port the process is running on. The Tableau Server status page does not show TSM processes. For information about signing into Tableau Server as an administrator, see Sign in to the Tableau Server Admin Area. 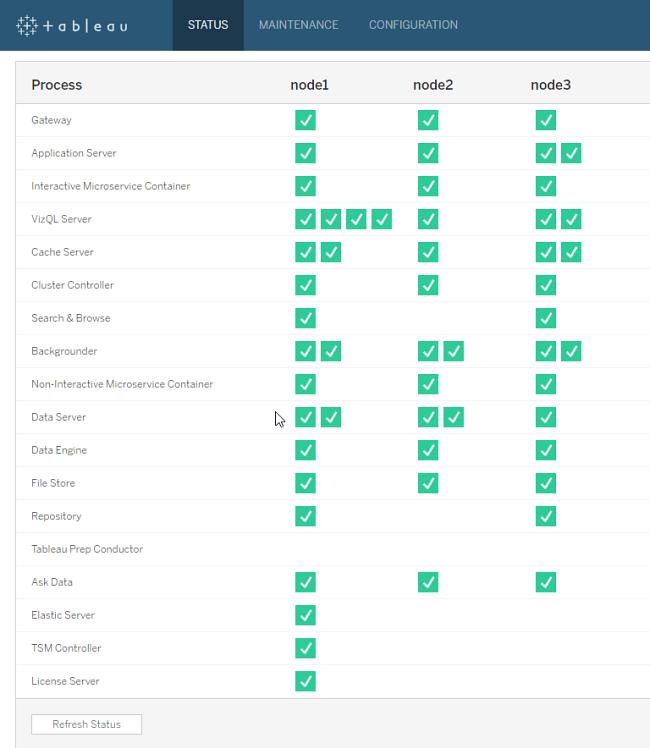 The TSM Status page shows you the state of server processes, including TSM Controller and License Server. These two processes do not display on the Tableau Server Status page. Active—The process is functioning as intended. See File Store in Troubleshoot Server Processes for details on possible active states. Busy—The process is completing some task. See File Store and Repository in Troubleshoot Server Processes for more information. Down—The process is down. The implications of this differ depending on the process. Status unavailable—Tableau Server is unable to determine the status of the process. For more information about troubleshooting process status, see Troubleshoot Server Processes.